Millie Heapy continues to score goals this time with another brace, also Deborah Scotcher (2), Shelley Strudley (2) and Carla Rose were the other scorers. This was Clevedon's first deafeat in four games. Welcome to the South West Women's Football Combination League Website. This will be your first place to check all the latest news and results within your League, featuring Latest Results and Fixtures and various statistics involved with all the teams, such as League Tables, Form Tables, Leading Goalscorers, Season Results and League Records. There is also an Archive Section about previous winners of the League, a Club Directory and a feature on the Ambassadors League Cup. The South West Combination Women's Football League was formed in 1998 as part of The Football Association's initiative in Rationalisation of Women's Football, in conjunction with three other Combination Leagues (namely South East, Midland & Northern). These four Combination Leagues, each with twelve teams, reside above the ten Regional Leagues in the country and feed into the Southern & Northern Divisions of the FA Women's Premier League. Clubs are relegated and promoted into the SW Combination via the South West Region and Southern Region Leagues; six clubs each were promoted from these leagues for the inaugural SW Combination season 1998/1999. The founder members were Bath City, Bristol City, Bristol Rovers, Cardiff County (now Cardiff City), Cheltenham (now Cheltenham Town), Denham United, Oxford United, Portsmouth, Saltash Pilgrims (now Plymouth Argyle), Sherborne (now Yeovil Town), Swindon Spitfires and Swindon Town. The end of the first season saw League Champions Cardiff County promoted into the Southern Division of the FA Women's Premier League and Swindon Spitfires relegated back into the Southern Region Women's Football League having lost all 22 of their league matches. There was no relegation from the Southern Division of the FA Women's Premier League above - this was to increase the number of teams in the Premier League. The Combination League also welcomed two new additional member clubs, Newport Strikers and Southampton WFC, champions of their respective leagues. The South West Combination Women's Football League's Cup Competition is sponsored by Ambassador Coachworks in Woking, Surrey. In it inaugral season the Ambassador League Cup was won by Swindon Town who beat Cheltenham in the final. The second season (1999/2000) saw Newport Strikers take the championship by two points from Bristol Rovers, whilst Bath City and Southampton WFC finished in the relegation zone. Southampton avoided the drop because there was no relegation from the league above. Bath City departed the SW Combination with the unenviable League Record for the "Worst Goal Difference" (-129) and only four points. Clevedon Town and Reading Ladies were promoted from the South West and Southern Region Football Leagues. Swindon Town defended their Ambassadors Cup title by beating Newport Strikers. Bristol Rovers were the record breaking champions of the 2000/2001 season, finishing the season unbeaten with 20 wins, 62 points and a +70 goal difference. Denham United and Oxford United were relegated, with Oxford failing to win a single game. Two teams joined the SW Combination from the Premier League, Reading Royals and Cardiff City. Newton Abbot were promoted as Champions from the South West Region. The Joint Liason Committee was convened and decided that Chesham United, Champions of the Southern Region should be moved across to the South East Combination League due to their location, ensuring the SW Combination maintained 12 teams. The League Cup was taken for the third season in a row by Swindon, again beating Cheltenham in the final. Bristol City were the League Champions Cheltenham Town and Southampton were relegated. The League welcomed Aylesbury United (formerly Berkampstead Town), relegated from the Southern Premier Division. Exeter City and Chesham United were promoted. Undefeated three times champions Swindon Town were finally defeated in the League Cup when they went down 4-1 to Cardiff City in the semi-finals. Cardiff went on to lift the cup in style, emphatically beating Newton Abbot 5-0 in the final played at Elmore Football Club in Tiverton. Here you can download the PLAYER REGISTRATION FORM. The two remaining South West Combination representatives in this season's cup, were drawn at home to AXA Womenâ€™s Premier League Northern Division sides, which should be good tests for both Cardiff and Reading Royals, who will face Wolverhampton Wanderes and Aston Villa Ladies respectively. Fulham have been matched with Doncaster Belles as the last two names out of the bag in the Fourth Round draw of The FA Women's Cup, in partnership with Nationwide, to set up a repeat of last year's final, which Fulham won by two goals to one. Several other top teams were also draw against each other, leaving the opportunity for lower league teams to progress in to the 5th Round. Hosted by Ray Stubbs the draw was held at the Match of the Day studios at BBC Television Centre, Wood Lane. The balls were drawn by CBBC Exchange presenters Angelia Bell and Joe Challands. 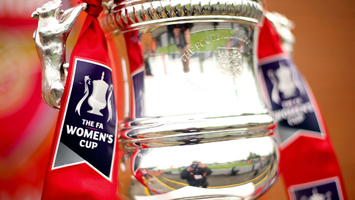 Ray Stubbs said: "I was delighted to host the Fourth Round draw of The FA Women's Cup. I enjoyed hosting BBC's coverage of the Final last year, which was a great showcase for the women's game. The draw has thrown up some great ties for the Fourth Round and look forward to watching the progress of the competition." The Fourth Round will take place on Sunday 5th January on FA Cup weekend, the day after the men's Third Round matches. The Final will once again be shown live on BBC1 this season. Last season's final between Fulham and Doncaster Belles at Crystal Palace, was watched by a BBC audience of 2.5 million. Cardiff City 6 - 0 Newton Abbot: This match was played in driving wind and rain and it was Cardiff who lead early on from Chantelle Millers long range shot. Carloyn Cooper made it 2-0 before the Abbots keeper Natalie Dipper suffered a serious injury that saw her taken to hospital. Despite a spirited performance by the visitors in the second half, Cardiff notched up further goals from Helen Jones, Emma Meredith (pen), Marrie Barrow & Charlotte Preen. Chesham United 7 - 0 Aylesbury United: Chesham entertained near neighbours Aylesbury and ran out comfortable winners with goals from Sian Williams (4), Georgi Josie (2) and Emily Rampton. Clevedon Town SBW 0 - 2 Porsmouth: Portsmouth equalled Swindon Town's record of EIGHT consecutive league victories with this win over Clevedon. They left it late though with goals from Charlie Wilson and Laura Froggart sealing the points late on. Clevedon failing to score makes this Portsmouth SEVENTH clean sheet this season. Plymouth Argyle 0 - 5 Reading Royals: Reading Royals impressive streak continued at Plymouth. Goals by Carla Rose (2), Tash Taswell, Kelly Chambers and Shelley Strudley saw them maintain second place in the league. Reading Ladies 2 - 1 Exeter City: This third consecutive win for Reading saw Serena Hickman add to her already impressive goal tally this season after only 30mins, Leila Dickinson scored the other goal. Becky Folds got the consolation goal for Exeter who are now three points adrift of Swindon at the foot of the table. Yeovil Town 0 - 1 Swindon Town (Match Abbandoned): The game started with strong winds and steady rain and there were few chanced in the first period. The rain came down harder in the second half and it was Swindon who scored with a long range shot from Michelle Rich. Unfortunatley for Swindon, the weather continued to deteriorate and the match was abbandoned by the referee after 56mins and will be replayed at a later date. Aylesbury United 1 - 4 Reading Ladies: A hat-trick by Serena Hickman and one from Denise Daniels gave Reading Ladies the win against Aylesbury whose goal came from Sarah Davis. Reading have now won three our of their last four matches. Exeter City 0 - 4 Plymouth Argyle: Plymouth won the Devon Derby by four goals against Exeter from Clare Harling, Louisa Strentford-Crook and two from Kate Middleton, who is now the League's Leading Goalscorer. Exeter slipped into the Relegation Zone for the first time following this weekends results. Reading Royals 2 - 0 Clevedon Town: A close fought game but two late second half goals by the Royals moved them up to second in the table. An Own Goal and a Cheryl Williams goal secured victory, ending Clevedon's unbeaten 5 match sequence. Swindon Town 5 - 2 Newton Abbot: Swindon's second win in two weeks took them out of the relegation zone for the first time this season, with Lucy Bailey scoring a hat-trick and a brace from Michelle Rich getting Swindon's goals whilst Kirsty Caunter and Karen Smith scoring for Newton Abbot who have now lost four matches in a row. Yeovil Town 2 - 1 Chesham United: A goal on 12mins put Yeovil ahead, Sophie Curry's free-kick being headed home by becky Webb. Chesham then missed a penalty before Lucy Welling equalised on 30mins. Mariesa Dryhurst scored Yeovil's winner from 20 yards with 15mins to go. You can read more results at our dedicated page. www.southwestcombination.co.uk does not warrant that: the legal information on this website will be constantly available, or available at all; or the legal information on this website is complete, true, accurate, up-to-date, or non-misleading.